An Empty Block (sometimes referred to simply as a Block or a Steel Block) is a type of block in the Mario franchise that usually appears when Mario, Luigi, and their friends hit a ? Block, an item-holding Brick Block, or a Coin Block, though they sometimes are naturally already in an "empty" state. 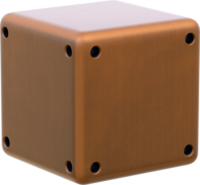 Empty Blocks are usually brown round-edged cubes with small holes in their sides' corners. In Super Mario World, Empty Blocks have small, closed, angry eyes, but no holes; if the player hits a blue P-Switch, all Empty Blocks turn into coins and vice versa for a short time. Empty Blocks can only be broken by Mega Mario or stronger enemies, such as Broozers, King Bills, and Giant Bowser. Empty Blocks also appear in the Super Smash Bros. series. They first appear in Princess Peach's Castle in Super Smash Bros. Melee, if the red, blue, or green ! Blocks are touched or hit (or if items are turned off). In Super Smash Bros. Brawl, ? Blocks on Mushroomy Kingdom become these if hit or jumped into from below and they are refilled when the stage loops; they are made of wood with metal borders, and like the rest of the stage, they look more realistic. In 3D Land in Super Smash Bros. for Nintendo 3DS and Super Mario Maker in both the 3DS and Wii U versions, they act the same as in Brawl, but have their respective appearances; Empty Blocks are instead refilled after a while on the latter stage. Super Smash Bros. Ultimate brings back not only the aforementioned stages, but also the Mushroom Kingdom stage from Super Smash Bros.; in this version of the stage, the pass-through platforms are made of Empty Blocks, rather than Hard Blocks, as in the original version. Empty Blocks are also embedded into the brick wall at the left side of the stage, and they are also used as the paths and ledges fighters walk and grab on. Giant Empty Blocks also appear in Super Mario Bros. 3, Super Mario Galaxy 2, Super Mario 3D Land, New Super Mario Bros. U, and Paper Mario: Color Splash, usually after hitting Giant ? Blocks or certain Big Blocks. In Worlds 4-2 and 4-5 of Super Mario Bros. 3 and the Supermassive Galaxy in Super Mario Galaxy 2, they appear naturally, forming part of the levels' structures. Also, in Super Mario 3D Land, Giant Empty Blocks are found in hidden rooms accessed via Warp Pipes (as well as in World 6-3), and are often put together to form sculptures that create 3D illusions. Rectangular Empty Blocks appear in Super Mario 3D Land, New Super Mario Bros. 2, and Super Mario 3D World as a result of hitting rectangular ? Blocks. From left to right: Super Mario Bros., Super Mario Bros. 3, Super Mario World, Super Mario All-Stars (SMB and SMBTLL), Super Mario All-Stars (SMB3), New Super Mario Bros. Artwork from New Super Mario Bros. Wii. Artwork from Super Mario Galaxy. In the Super Mario Mash-Up Pack in Minecraft, Bedrock is replaced by Empty Blocks. ↑ Super Mario Galaxy manual, page 18. ↑ Walsh, Doug, and Joe Epstein (2017). Super Mario Odyssey Prima Collector's Edition, page 22. This page was last edited on April 22, 2019, at 21:43.